you won! Either comment here with your email address and book of choice, or PM me on my Facebook page (just click on the Facebook icon under "Connect With Me" to the right there). Now on to today's book. Not only is Kate my agency-mate, but she's also one of my favorite authors. I couldn't wait to get this book into my hands. Here's a short blurb, and we'll chat on the other side. With Britain caught up in WWI, Jack Benningham, heir to the Earl of Stonebrooke, has declared himself a conscientious objector. Instead, he secretly works for the Crown by tracking down German spies on British soil, his wild reputation and society status serving as a foolproof cover. Blinded by patriotism and concern for her brother on the front lines, wealthy suffragette Grace Mabry will do whatever it takes to assist her country's cause. When she sneaks into a posh London masquerade ball to hand out white feathers of cowardice, she never imagines the chain of events she'll set off when she hands a feather to Jack. And neither of them could anticipate the extent of the danger and betrayal that follows them--or the faith they'll need to maintain hope. Let me first say I fell in love with that cover long before I did the book:) So when I finally purchased it to read, I was ecstatic to open the first page and dive in. The first chapter sets up these two characters so well. He's cocky. She's determined. And they have wrong impressions of each other. I was rather sure I knew where things were headed. That's one detail I loved about this book. After reading the back cover blurb and jumping into chapter one, I anticipated exactly what would occur in their second meeting. I was immediately surprised to find out I did not. Kate adds an unexpected dynamic right when Jack and Grace collide again, and that aspect kept me turning pages with the understanding that Kate holds nothing back from her characters. They are real. Flawed. Hurting. And funny. Witty. Independent and intelligent. Suffice it to say, they're multi-faceted. My only complaint about the book is I wish Jack and Grace were on the page more together, specifically at the beginning. I loved their initial meeting, which was intense and filled with a wonderful chemistry. Then things downshifted while other characters were introduced, the setting changed, and Grace and Jack were almost, in a sense, reintroduced. That being said, I loved these two and the supporting cast. Each character is unique and only enriches the storyline along with Grace's life, allowing her to become a lead I enjoyed on so many levels rather than simply through the eyes of the hero--which the romantic in me loved as well! Another aspect I enjoyed was how the plot fully supports the title, and Not by Sight became a running theme on so many levels. By the time I closed this book, I had been thoroughly entertained. 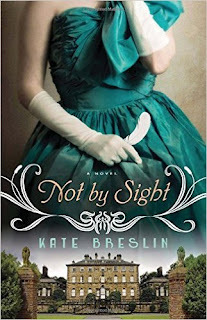 A sweet romance with endearing characters and a well-crafted plot, Not by Sight is Kate's sophomore novel and will find a permanent place on my bookshelf right beside her debut. You can purchase Not by Sight here. And come back Monday to meet Kate, who'll be guesting on my blog. Thanks for sharing your review. It sounds like a good story to read. Susan, thank you for that wonderful review! And I'm so thrilled with the artwork on my cover. Still pinching myself over my good fortune. :) God bless!